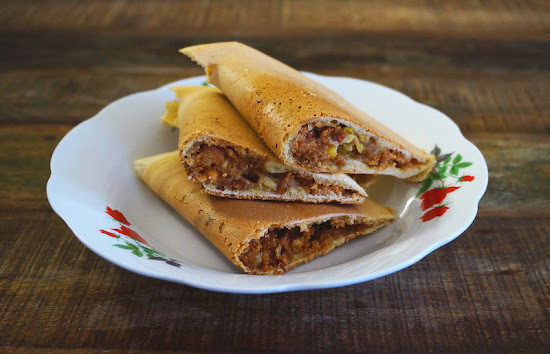 Crispy Apam Balik or also known as Crispy Pancakes with peanut filling, is a popular snack in Malaysia. The pancake is typically crispy, lightly sweeten with sugar, peanuts, and cream corn. Well, do try this simple and wonderful snack. In a bowl, whisk together all purpose flour, rice flour, sea salt, baking powder, baking soda, eggs, sugar and water. Wrap the bowl in a plastic wrap and let the batter rest for 2 to 3 hours or overnight in the fridge. Lightly oil a small non-stick pan or a crepe pan (about 5 - 6 inches diameter) over a moderate heat. When the pan is hot, add about 3-4 Tbsp batter, evenly coating the pan. Cook for about 1 minute, as the batter sets and forms small bubbles, loosen the edges with a palette knife. Sprinkle some sugar and peanuts on top of the pancake. Continue to cook until the pancake is light golden brown in color, about 4 to 6 minutes. Then top it with 1 tsp of butter and some cream corn. Lift the pancake from the pan, fold into half and serve immediately. I tried making this earlier tonight but it turned out to be like dough so I added some water to it. Was water missing from the recipe? Batter did out turn out the way it was supposed to be. I wondered if it's because I added to much water to it? I added more water because I thought the batter was still too thick. @Doreen: The batter should be fairly thick. Should I sieve the batter? @Doreen: You don't have to sieve the batter. Just make sure the batter is smooth and free of lumps. beautiful post! this reminds me of the hawker stalls that sell the small "pancakes" prepared in cast iron forms. 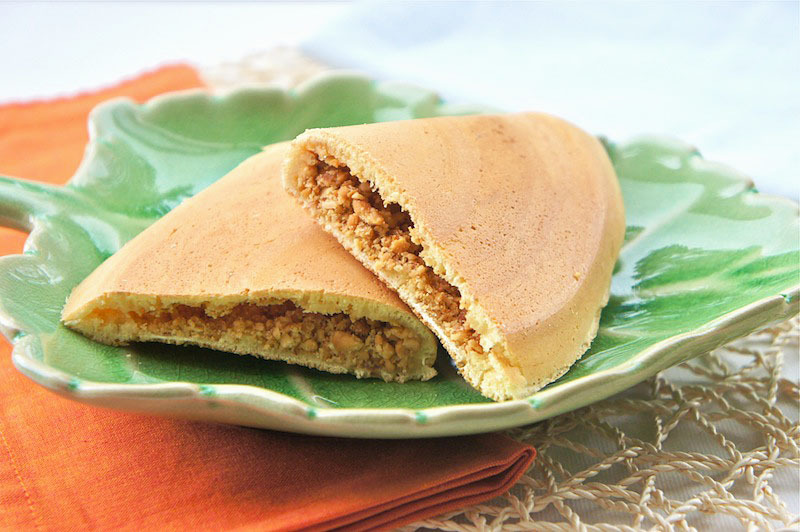 ...I always loved the peanut and red bean ones! @taste traveller: You're welcome and do try the recipe. I´ve had them this morning for breakfast. Delicious!!! oh wow you've made me miss malaysia so much with these ones......they are to die for! can't wait to try this recipe! I used to eat these when I lived in Singapore... and this reminds me how great they are. I'll have to make it! What in interesting filling, especially with the corn. Love how fluffy and delicate these pancakes are, too. hi, i have only baking powder..what is double action baking powder or any alternatives?